Woo hoo! We got another exciting gift in the mail today. As soon as I saw my Aunt Pattie’s handwriting, I knew it was going to be something cute and clever. She’s famous for giving really clever and thoughtful gifts, and she remained consistent this time around. Pattie, who’s married to Barry, one of my dad’s brothers, has the best luck when it comes to shopping. So when I read the note that said “Silly little thing that reminded me of you!! !” I knew it would be far from silly. I unfolded the note and found a bib! 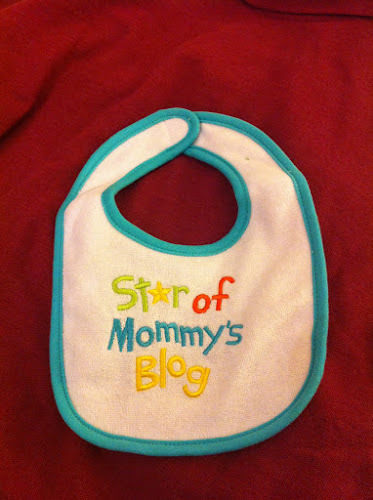 Baby Friedman already has a little bib collection going, and this novelty bib definitely has me pegged. Here’s what’s really special about our relationship. Pattie has two daughters who I adore. 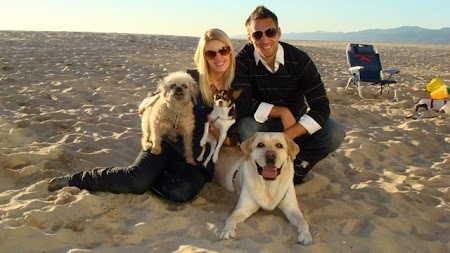 Corrie, the older daughter, is already mama of the year, raising three adorable kids. And Jaimie, the younger daughter is sharing the pregnant card with me! She and her fiance, Matt, are due with their baby boy at the end of August, so it goes without saying that it’s going to be an exciting summer in the Siegel family! Jaimie and I are about four years apart, and I’ve always enjoyed her company. Not only is she a brilliant veterinarian, but she’s a really kind and compassionate person. I remember when I was a kid, I copied her every move and followed her around hoping to become like her through osmosis. We were close enough in age that it was appropriate, but distant enough for me to see her on a pedestal. And now it seems like we’re closer in age and we’re both having babies together, and I couldn’t be happier! I can’t wait to watch her son and our daughter grow up together. They’re going to have so much fun at family Chrismukkah gatherings and playing on the beach in front of Pattie and Barry’s beautiful home. As the youngest in my generation of cousins, I’ve watched the kids of my older cousins grow up together enjoying fun times from Barbies, to bounce houses, to baseball, and I’m so glad that Baby Friedman will know a life filled with other cute and well-behaved kids who can lead the way. And she’ll have Baby Pernice, her own birth buddy, by her side. And I will blog about it. Sounds like an incredible family! OH WAIT! It is and I am proudly part of it!! !